With the fall TV season premieres just around the corner, I’m excited to announce that PlayStation Vue is coming to Dallas and Miami. Starting today, all PS4 and PS3 owners in the Dallas-Fort Worth and Miami-Fort Lauderdale areas can choose from three PlayStation Vue multichannel packages — Access, Core or Elite — starting at $49.99. With PlayStation Vue, you get access to live local broadcast channels, so you can catch up on local news or cheer on your local sports teams, as well as save your favorite shows to our cloud DVR. Also, as a reminder for all the soccer fans out there, Fox Soccer Plus will be available through PlayStation Vue later this summer, ahead of the upcoming season of the UEFA Champions League. Fox Soccer Plus will be available as a standalone channel to all PS4 and PS3 users across the country for $14.99/mo. and $12.99/mo. for PlayStation Plus members. Stay tuned for more information on Fox Soccer Plus. We are working hard to bring Vue to more major cities and to expand our nationwide offerings. 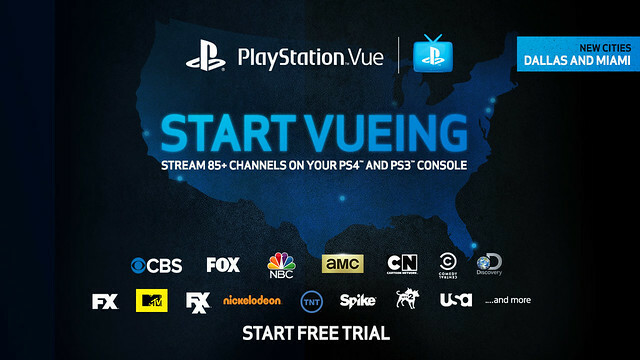 Be sure to stay tuned for more updates on PlayStation Vue and check out www.psvue.com for more information. Fox Soccer Plus as a standalone is great. Especially with a PS+ discount. When can we start paying for channel’s individually? We’ll be launching a selection of channels nationwide that can be subscribed to individually through PlayStation Vue, including SHOWTIME (available now) and Fox Soccer Plus coming soon. Stay tuned for more updates! It seems to be such a slow launch. City by city. No chance to get this service in Canada. I’m digging Showtime as a Stand Alone on PS Vue, hope Fox Soccer Plus is the first in a wide variety of stand alone channels! While I haven’t used Vue yet (not in my area, and probably won’t be for awhile) – how about the rest of you? What do you think / do you like it? It’s pointless if you live in SoCal and are a Lakers fan.. TWC in SoCal is the same price, with more channels, plus we get TWCSportsNet for Lakers’ games. Other cities may have a different experience, but, for us, it’s just another service with nothing special about it. Not enough to pull us away from what we already have. Great to see Vue inching into a couple more cities but at this rate I’m wondering when medium sized metro areas will have the chance to get access. Bring Vue to Baton Rouge and New Orleans so I can throw more money at you Sony! Bring to Atlanta areas. I’ve been wanting to use PlayStation Vue for a while now. Thanks for your feedback! We’re working to bring PlayStation Vue to more cities and will keep you posted when new markets are added. Still need Seattle! Also, why no PBS? I’ve been so exited about this service since it was announced. My wife and I cut the cord years ago, because we were paying close to $200 a month, which is outrageous for live T.V service. Netflix and Hulu is beginning to feel like they’ve ran their course, so to speak. Playstation Vue seems like the perfect deal for our situation. We want live TV again, but we don’t want to pay an arm, a leg, and our first born child for it lol. Unfortunately, we live just outside of the St. Louis area, and PlayStation Vue has yet to reach that area. If it’s been explained in the past, I must not have been informed, but I am curious, as to why a very slow rollout of this service is taking place across the United States? I have an idea why, but assumptions aside, I’m also curious as to what kind of time frame you expect this service to be completely rolled out nation wide, and given my location, where I fall within that timeframe. That said, my money is still waiting Sony. I believe that part of the issue is that they need to coordinate with local TV stations to digitally stream them. I’m sort of waiting for Seattle, even though I have SLing now and am very happy with it. I have to agree, netflix and hulu very old now the same run of the mill movies and shows that we dont watch anyways. Now even though we get all of the following below, i still only watch about half of those stations even with cable. I mean 50 a month in a sense is still the same price i would be getting from cable but triple the station. A much needed price drop would go a long way with the PS community. This is one of the slowest rollouts I’ve seen. I’m sure the television industry is more complex than I understand but I’d love to see the pace pick up. This is one of the only things we have to look forward to since Sony is moving like a snail when it comes to adding new features to PS4. Curious about the range of these services. I’m near Milwaukee… Would that be close enough to be considered part of the Chicago market? Just started up Vue for the first time (in Dallas area) but can only get Showtime, it doesn’t even give me options for any other package. I’m wondering if they haven’t fully rolled it out yet and I have to wait until later today or if this is all I get. Ridiculous pricing structure. ESPECIALLY if you are in a Dallas area with a TWC service offering. First of all, cable & internet service is a NEGOTIABLE commodity. After a few phone calls & some strong negotiating I get the premier TWC TV package (including HBO), 50Mbps internet service & home phone for about ten more dollars a month than the Elite Vue package, which is nearly as limited as to be equivalent to Plex or even Hulu+. So, if you are a sucker, go ahead & get a mediocre ISP for $30 a month & then add another 50 to 70 for Vue. Or wait… You could pay nearly the same cost & have high speed internet & an infinitely greater selection of viewing content. We should be live in Dallas and Miami, so please check again and give PlayStation Vue a try. Let us know what you think! Looking forward to trying out Fox Soccer Plus and will probably add Showtime as well. Hopefully Boston Launches soon, would love to wave goodbye to Comcast. Also, please addd 5.1 surround sound to Vue. great news for people like me that live in the miami -ft lauderdale area.thank you! I second the motion for getting PlayStation Music on Vita. My 3G Vita is my phone, and it currently plays Tunein 10 hours a day, but it would be much nicer to have music on demand again. It was so nice when we had Music Unlimited, being able to browse then web and play games while streaming music made the Vita miles better than any other mobile platform. Now it doesn’t offer the most used feature on mobile devices. Lets make this happen. So the worst package costs fifty bucks a month. A single add on channel is 15. And you still need to pay for internet on top. I know people have some outrageous cable bills. But that is bbecause they’re idiots, haha. No way am i paying for cannels one at a time. Been using PlayStation Vue for Showtime for the last month, and I am very happy. There are a lot of people acrossthe Puget Sound looking for a service to get away from Comcast. Hope you guys can make it out here in the next month or so. I would love to be able to be able to have gurzts over to zhow off Vue during the NFL season. Also, we really need Vue on PlayStation Vita and PlayStation TV. The only other channel I would like that Vue doesnt already have is NFL RedZone. Any chance we see thsi in Canada? Who pays for this over-priced service? We re-negotiate our contract with Directv every year to keep it at a low price and we’ve always had NFL package thrown in for free. They simply don’t want to lose your business. Pretty sure we don’t pay more than $70 for way more channels than this has to offer. Fox Soccer Plus? Do they even show soccer anymore since losing the EPL to NBC? beINsports is the channel to have these days if you like soccer. They show BBVA, Bundesliga, Serie A, and Ligue 1 matches. We can add a sports package with Directv for $10 that includes tons of other sports channels plus beIN. $15 for Fox Soccer Plus alone? What a rip off. Also, it states that Vue has local channels so you can watch your favorite local teams. Uh, yeah. Pretty much every single sports team carries their games on a cable channel now. Outside of your local NFL team, good luck finding a college or pro basketball or baseball team on a local channel. I get more content from Netflix for less than $10 than these channels provide. Way, way, way over-priced, especially when they’re using your internet connection that you’re already paying for. There’s a sucker born every minute I guess. Is there a place where we can vote on what channels we would like to have individually? I know for my family we would love to have the Food Network. Nice. I already have Showtime, and now I can add more stuff. Although I am going to wait for individual channel options at reasonable prices or custom bundles where I can pick 3, 5, 10 whatever. I have no interest in paying for things I don’t use. The truth be told, I’m like 30 to 40 miles north of Dallas. Would that be ok? I am on far west edge of Fort Worth. It was available / working for me. Can you guys bring PlayStation Vue to the Buffalo, NY Metro area? $50 a month is a lot for the base package because that’s exactly what i pay for my cable on COX here in VA. I’d much rather have to ability to pay for channels individually but not at ridiculous prices like $10-$15 a channel. If that’s how much they cost by themselves, what the point of even announcing individual channels like that? I get channels like Showtime and HBO and such are “Premium” somehow but will regular channels like Cartoon Network, Nick, TBS, Travel, MTV, Disney, etc be priced like that? The basic package is $50 for $50 channels so i would hope that separately each “basic cable” channel cost no more than $2. It only makes sense. Can I use Dallas vue in Austin? can you get local programming from outside of your regional area? With Showtime it gives option of view live the East or West live stream. For the Core channels, far as I can tell there were no local channels. I was excited when I initially heard that PS would be getting in to tv. But seeing how they decided on the outdated/anti-consumer “package” model. Plus being more expensive than the already overpriced cable. I am really glad this isn’t available in Canada and I hope it never comes here in its current form. You have such an opportunity to offer something different and better than cable. It’s a shame you decided to just do it the same way that nobody likes. Make every channel pic and pay for a reasonable price and you will gain a much larger market share. Oh well….. Yes, you can pause and record with cable. IF you have a DVR. This is bs, hbo nationwide but not vue tv? Worst launch in history, i was gonna get satellite but i heard about this an decided not to but i live in deer park WA spokane county an its been over 6 mounts since it first launch in 3 citys, im getting satellite since im not waiting any longer for this, ur working hard to get it available in more citys? BS u ner see did hulu or netflix start in citys? NO! It was available in every state in the U.S.A.
Netflix and Hulu are not doing live local sports, and local networks. Sony has to sign deals with the local fox, nbc, cbs, etc. stations to get the rights to stream their content. This takes time. Things like Showtime and Fox Soccer Plus, which are nation wide premium channels will show up in time and be available to everyone, but it will take quite a while to get nation wide support for every local channel, and some places won’t get it for years due to internet speeds. Give it time. If you need live TV right now, their is no problem getting cable or satalight for now. You will always be able to try Vue free for a month whenever it reachs your home town. I’m in the North Plano area and I’m not seeing an option to upgrade my vue services. Am I too far away from Dallas? If you have Showtime you should be able to get the local vue channels, go to settings on your Showtime, go to subscription, then go to update subscription. I live in Fort Worth and was able to subscribe last night. Hopefully that helps you out. Hey Eric, One last thing I wanted to say. HBO absolutly needs to find its way to Vue, and ASAP. I only have PlayStation devices, and I am the only one at work missing out on Ballers and Game of Thrones. Hook a brother up. There was a 7 day free trial so I added the Core ($50/month) package of channels. It works fine like Showtime when watching older stuff, but when watching Live, the ad interruptions come in very abruptly and they don’t return you to where you were before that disruptive intrusion. Showtime live doesn’t have this problem. well Showtime dont have commercials, they never did. regualar channels do like abc, tnt, etc. u will get commercials regardless. even Playstation Vue said we will get commercials like if we was on a different cable box. When are Univision,Unimas,Fox deportes,espn,espn 2,espn deportes coming to Vue? Why the resolution is only 720p and not 1080p? Finally! It fills great to be vue’ing with Sony’s new service, I live in Fort Worth so if you live in the DFW area you should be able to get this service. I would recommend an ethernet cable tho. Oh yea, I would also recomened the Live Events Viewer app for those of you who watch PPV events! The tortoise like speed you’re going at makes me want to go back to cable tv. 5 whole cities? Come on get the lead out. Do you want my money or not? Hope we will get VUE soon. All I care for now is the availability of FOX SOCCER PLUS on PS Vue! Thank you, SONY! I’m a soccer fan and I can’t wait to try it out. By the way, I hope the price of PS+ members will be announced soon! When will the NFL come, since NFL is just around the corner next month. Hoping it comes to the Central Coast of California in the near future. Came to LA right as I was moving (but it was an area where Uverse was available anyway) to an area where Comcast is the one and only TV provider, so I’ve been without TV service until one of these services like PS Vue or the rumored service from Apple. I hope you take my comment seriously and don’t think I’m just bashing for the sake of bashing. This is a legitimate piece of feedback. I thought this was going to be the a la carte savior for tv – a cable killer – a way to cut the cable cord and get away from the ridiculous practice of paying for channels you don’t want. As it is, it’s just a similarly priced alternative to cable. Please add lots more channels to a la carte so we can pay for only the channels we want or the service might as well not exist. Glad i live in North Dino. Thank you Sony Playstation Team for bringing Vue to the Triple D ! Need this service in the Pittsburgh area. Why are you skipping around other cities? I am not happy about how your going with getting this service for everyone to get it especially its taking way too long. Follow guide we have for you and you can make 90 dollars every hour… Our agents earn around $12k a month… Join them… and start working from comfort of your home! All you need is a computer and a internet connection and you are ready to start. Learn how to make a steady income for yourself on following web adress…. When is vue coming to Arizona?